The mid-size SUV class houses several models that can help out all manner of drivers with a range of common, and some unique, driving tasks, but, with the variety of offers in this category of vehicles, which is the one that best fits all the items on your car shopping list? While many mid-size SUVs have expansive cabins, capable powertrains, and loads of technology, we contend that the Ford Explorer is among the leaders for many of the car shoppers that come to our dealership. It shares some engines with the rugged Ford F-150 truck, so you know that it's capable, has a cabin that you can simply alter to fit better the passengers or items you need, and has smart features throughout. For these reasons, and a few more we've highlighted below, we think many car shoppers considering a three-row SUV will prefer the Ford Explorer over others like the Honda Pilot, so see more about how the two stack up by reading on! Other design aspects of the Ford Explorer, like its tighter turning radius than the Honda Pilot, are part of why it is the more capable of the two mid-size SUVs, but that advantage really comes down to the powertrains. The Ford Explorer has three engine options, two of which have either more horsepower or torque than the 280-horsepower V6 with 262 pound-feet of torque of the Honda Pilot, and the third Explorer engine option, an EcoBoost® V6 engine, has 365 horsepower and 350 pound-feet of torque. These engines help with everything from getting up to speed on the highway to towing trailers, but they, in conjunction with other features like four-wheel drive and Hill Descent Control, also make the Ford Explorer more capable of, well, exploring. If you want to go on more trails and off-road journeys without wondering if your car is up to the task, the Explorer is the clear victor over the Honda Pilot. The three-row nature of mid-size SUVs makes them a popular option for families, and for those transporting little ones, it's nice to know that your car has the safety ratings and features to inspire confidence. Well, the 2019 Ford Explorer earned five stars on the Overall Front Safety Rating test of the NHTSA while the 2019 Honda Pilot scored four stars in the same metric. To go along with these crash test ratings, the Explorer offers safety features, like a 180-degree front-facing camera, inflatable rear seatbelts, and Active Park Assist, that car shoppers won't find in any Honda Pilot. A lot of thought went into the design of the Ford Explorer, and that shows in quite a few areas when comparing it with the Honda Pilot. It has more legroom for every row and more headroom in the front two, which you'll notice when driving full-grown passengers. Plus, the cargo area behind that third row is larger in the Ford Explorer, and it has more trims with roof rails than the Pilot does, so you can use the full passenger capacity without having to leave behind any of the items you want at your destination. On top of this room, the Ford Explorer offers a more luxurious ride with its Platinum trim, which has a steering wheel with real-wood accents, Nirvana leather seats, Active Motion seats with a massage function, and satin chrome exterior accents. 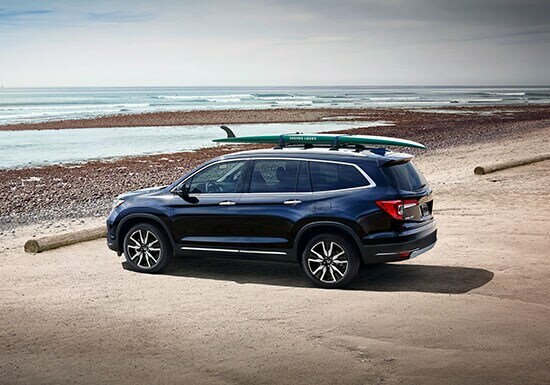 These help you stand out in style while relaxing in the sophistication that such high-end materials deliver, which you won't get in the Honda Pilot. We hope that this clearly highlights the advantages of the Ford Explorer, and, if you have any questions or have settled on the Explorer as your next vehicle, reach out to our dealership today, and a member of our team can aid you with whatever help you need.